Areas allocated to rubber, oil palm and logging concessions cover around a quarter of Liberia’s total land mass. Liberian activists and the international community have warned that land disputes on oil palm concessions were becoming a time bomb for conflict in the country, and urging lawmakers to give indigenous communities full rights to land the government had handed out as its own. In September 2018, President George Weah signed the Land Rights Act into law. The law is ambitious and clearly asserts the right to what is known as “customary land,” territory that can be claimed through oral testimony and community agreement. However, locked within the legislation is a flaw for those living on the quarter of the country’s land set aside for concessions: it is not retroactive. 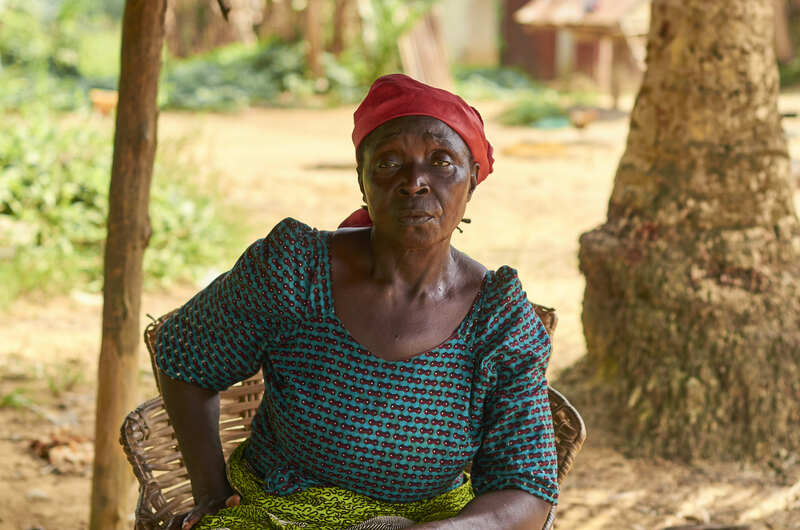 The law will not apply to those already living close to oil palm concessions, a difficult truth that is only just beginning to permeate thousands of villages in Liberia. JACKSONVILLE, Liberia — When rebels tore through the ancient forests of Sinoe county during the civil wars that ravaged Liberia between 1989 and 2003, villagers often fled to the only road in their district to escape death or mutilation. Sometimes miles away on foot, small towns that sat on wide, unpaved tracks offered safety in numbers, and the hope that help might arrive one day soon. Beatrice Flahn uprooted her family to a settlement called Jacksonville, and never left. However, she appreciated the freedom of cultivating crops and trapping animals for food once the war ended, roaming in an area stretching back into the abandoned villages. “Where we are sitting today, when the 14 years of civil war were fought, we fled and went to neighboring communities. We came and sat and squatted on the road, to have access to the road in terms of getting back what we had lost,” said Flahn, age 50. Beatrice Flahn. Photo by Jennifer O’Mahony for Mongabay. 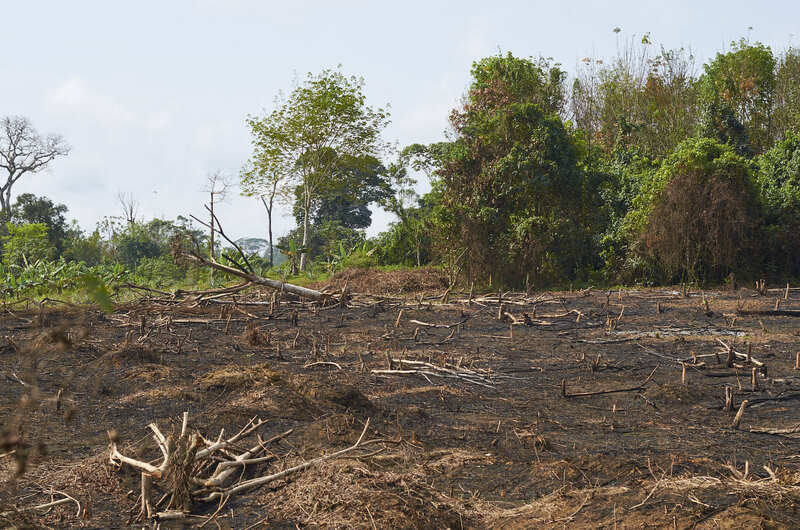 In 2013, the machines of Golden Veroluem Liberia (GVL), an oil palm developer owned by Singapore-listed Golden Agri-Resources (GAR), began clearing the forest for planting, exposing the fertile soil to the sky. This time, she fears, the land will be lost permanently. “It’s the original land where our farms and agricultural activities were. GVL has taken over all the land that our forefathers used for farming and hunting. They are taking over everything,” she whispered, her brow furrowing as she watched her grandchild playing close to an open fire. By the time GVL appeared in Jacksonville, following the previous government’s signing of a raft of post-war agreements with foreign companies, research indicates areas allocated to rubber, oil palm and logging concessions covered approximately 25 percent of Liberia’s total land mass. 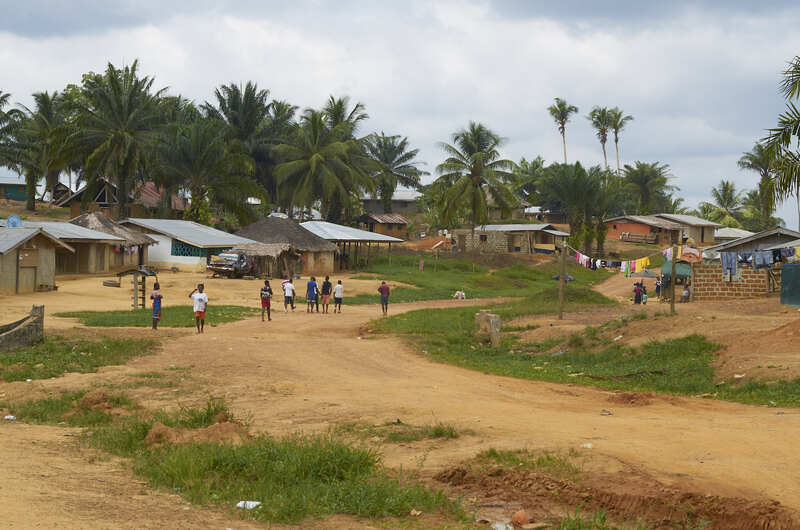 Riots, legal complaints and the freezing of operations have hit oil palm projects in Liberia in the intervening years, especially in southeastern Sinoe county, but also in northwestern Bomi county, where Malaysian firm Sime Darby has a concession. Meanwhile, demand for palm oil, the product derived from oil palms’ russet-colored fruit, has rocketed. Clients of GAR include Nestlé, Procter & Gamble and Unilever, and today the commodity is an ingredient in half of all products on supermarket shelves, including cosmetics, snacks and soap, according to Friends of the Earth. The palm oil industry was valued at $60 billion in 2018. By the middle of this decade, Liberian activists and the international community were warning that land disputes on oil palm concessions were becoming a time bomb for conflict in a country only barely recovering from the 1989-2003 civil wars, and urging lawmakers to give indigenous communities full rights to land the government had handed out as its own. Trust has eroded in several ways. In 2015 in Butaw, a town an hour’s drive from Jacksonville, young GVL employees requested a meeting with a visiting boss about working conditions, but management refused and called in riot police. A man named Fred Thompson was arrested despite not being present during the confrontation at the plantation; he died in detention and was hastily buried without an autopsy. A heavily pregnant woman was also arrested and another woman stripped naked in jail during the same incident, according testimony given by Butaw residents to Mongabay, and backed up by a raft of accounts at the time of the incident. Activists from Butaw, Liberia. Photo by Jennifer O’Mahony for Mongabay. Access to land is recognized as a key factor in Liberia’s long civil conflict, but the issue stretches much further back, to the country’s settlement and colonization by freed African-American slaves in 1847. “Americo-Liberians,” as they were known, held land individually rather than as a community, and often seized land by force. Their descendants remain some of Liberia’s richest and most powerful citizens. In September 2018, President George Weah signed the Land Rights Act into law, in what was hailed as a “landmark victory” by activists. Weah’s inauguration speech in January 2018 promised “clarity on fundamental issues such as the land beneath their feet,” and many citizens felt a long struggle was coming to a close. “The question was always like, we keep pushing this thing down the road, and there is a lot of interest right now to get it passed. Let’s just get it through,” said Ali Kaba, a senior researcher and program coordinator at Liberia’s Sustainable Development Institute (SDI). The law is ambitious and clearly asserts the right to what is known as “customary land,” territory that can be claimed through oral testimony and community agreement. However, locked within the legislation is a flaw for those living on the quarter of the country’s land set aside for concessions: it isn’t retroactive. 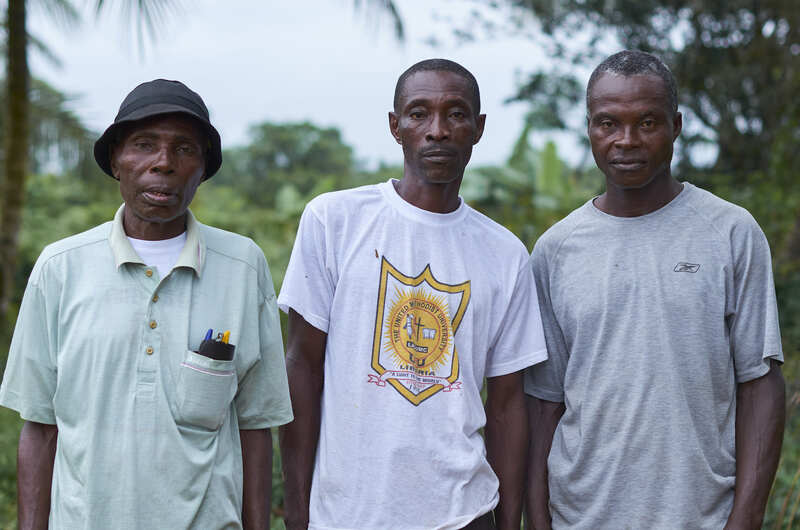 The law won’t apply to those already living close to oil palm concessions, a difficult truth that is only just beginning to permeate thousands of villages in Liberia, including Jacksonville. A GVL spokesperson told Mongabay in an emailed statement that the company did “not foresee significant changes to [the land sourcing] process with the Lands Rights Act,” despite the fact that the company has only identified a fifth of the land it was promised for cultivation. An area cleared of trees at the GVL concession in Tajuowon district. Photo by Jennifer O’Mahony for Mongabay. GVL’s concession agreement was signed in 2010, and gives the company 65 years to cultivate 2,200 square kilometers (850 square miles) of land across five counties, with the option of an extension that could increase its tenure to 98 years. Some experts believe oil palm concession agreements signed under the previous administration of Ellen Johnson Sirleaf will eventually be declared illegal for a host of reasons, including contravention of Liberia’s Public Lands Law and its tax code. But until a court case is lodged, residents and activists say concession communities are living in increasingly dire conditions, and in the case of Jacksonville have not even fully participated in official mapping of the concession to ensure they are paid the contractual $5 per hectare for their land every year. GVL also said it would prioritize employment for locals and establish a 400-square-kilometer (154-square-mile) outgrower scheme, which would allow residents to cultivate and sell oil palm themselves. Five memoranda of understanding (MoU) signed in Sinoe County are currently listed on GVL’s website, laying out the company’s promises to provide housing, schools, clinics and subsidized motorcycles to employees, and clean drinking water, markets, sports fields and roads for the benefit of communities living in concession areas. The delay in construction of these facilities will be two to three years, they add. Around 100 GVL employees live in Jacksonville, but six years later residents say the town has yet to see any of the facilities promised in the agreement, with the exception of two water pumps. Jacksonville, Liberia. Photo by Jennifer O’Mahony for Mongabay. Then there is the issue of consent. A group calling itself Blogbo-Teh in Jacksonville was unsure about signing the 2013 agreement, after local chiefs contacted the oil palm company without their approval. Blogbo-Teh members say they were sidelined by the company for raising concerns and then punished for their opposition by having more of their land cleared than that of acquiescent neighboring communities. “If you look at informed consent, from the way it is defined, GVL never got it. What happened is a marriage of convenience between local elites who have economic interest in the company,” said Simpson Snoh, who has led opposition to GVL in Tarjuowon district. Snoh said he believed GVL “did not get the consent of majority of people” to begin work in the area, and that “people did not even understand the content of the MoU.” A review of the document carried out by Mongabay with Jacksonville Mayor Ruth Chea showed the majority of those who signed in the citizen, youth and women categories are current employees of GVL. Deprived of access to farmland and unable to hunt in the concession area, the residents of Jacksonville now walk to neighboring villages to buy cassava and rice. A Mongabay journalist saw children trapping rats to eat. “The forest that they are damaging now is our supermarket. It’s our livelihood. There we have our medicine. Our entire life is in that forest and they are cutting it down,” said George Seeboe, 51 and unemployed. Many people in Liberia rely on herbal remedies to treat illnesses, as clinics and hospitals are located mostly in major towns and public transport is non-existent. His colleague Emmanuel*, who “brushes”, or cuts, branches from oil palm trees for a living, described working from 7 a.m. to 4 p.m. in hot, humid conditions without lunch. “The palm crippled some people. The fear is in me,” he said on a day when he was sent home without pay after injuring his hand. “They are building houses but they aren’t finished yet. I get no benefits for now but I’m a full employee.” Feeding, clothing and educating his four children adequately is nearly impossible, he added. Responding to these complaints, a GVL spokesperson told Mongabay the company has “clear HR policies which protects [sic] the rights of employees. The above examples are not in line with these.” The spokesperson added the company would investigate. 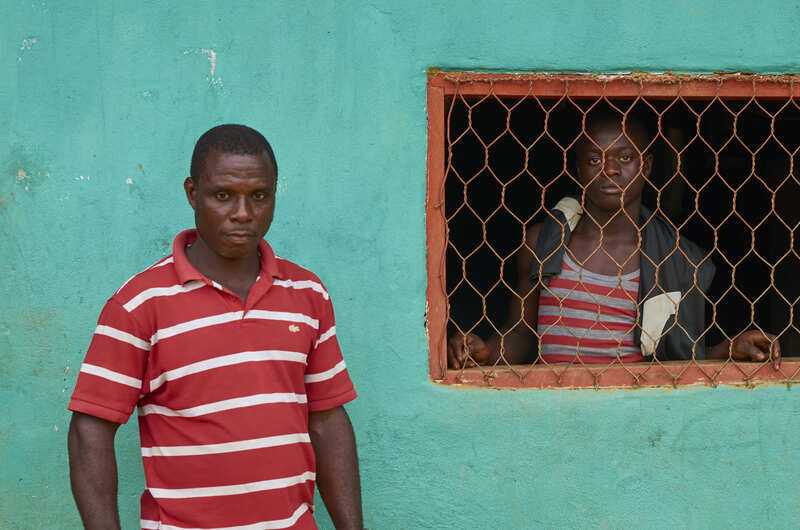 One deep-seated problem with Liberia’s concessions remains citizens’ lack of awareness of their own rights, according to activists, even when legislation protects them. Jacksonville’s citizens should already have been protected by the Community Rights Law, signed in 2009, when it came to obtaining community consent. But the demands of a local senator and traditional chiefs squeezed out groups like Blogbo-teh, two lawyers who have worked with the community to demand better treatment from GVL told Mongabay. Some of Jacksonville’s residents had heard about the Land Rights Act, and believed they could use it to fight GVL, while seemingly unaware of the provision about existing concessions. Others, like Flahn, who settled in Jacksonville during the war, had never heard of the new law. Not everyone in Jacksonville opposes GVL’s presence. Sarvage Klaybor, a GVL field conductor, or foreman, gets visibly angry when asked about the activists who have demanded the memorandum of understanding be rewritten. The current MoU is provisional, and could therefore feasibly be altered to provide stronger community protections. Klaybor said he supported GVL “because of development. I want to see myself prosper in life.” Following a promotion during his five years with the company, he lives in a house with a zinc roof — a coveted status symbol in Jacksonville. “GVL employs most citizens in the community, and rented the land from the Tajuowon people. $5 per hectare for 65 years,” he said. Sarvage Klaybor (left) and a member of his family in Jacksonville. Photo by Jennifer O’Mahony for Mongabay. Klaybor noted that when GVL started operations in Butaw in 2010, Jacksonville “was empty,” as desperate citizens emptied out to the neighboring town to look for work. “The people of Tajuowon wrote a communication to GVL saying they wanted them to come here and do their palm farm,” he said, adding that many of those now opposed to the company were happy to welcome them at first. The palm oil industry’s leading certification body, the Roundtable on Sustainable Palm Oil (RSPO), has repeatedly condemned GVL for the way it acquires consent and drafts and executes memoranda of understanding with communities in Liberia, and for its lack of “participatory mapping,” or surveying land with residents to ensure it is paying a fair price for land use. GVL suspended all land clearance in the whole of Sinoe county following the report, and launched a “sustainability action plan” with the aim of emerging “in 12-18 months as a strong example of, and advocate for, sustainable palm oil production in Liberia.” It has since resumed its membership in the RSPO, a company spokesperson told Mongabay. The RSPO, meanwhile, told Mongabay in an emailed statement that it believed the Land Rights Act was “a good start” to smoothing company-community relations. The RSPO “would like to see a bottom-up approach to land acquisition where companies first engage with local communities for their consent” as per its requirements, the statement added. However, activists say that given the RSPO’s lack of judicial authority, the only way forward is to expose the concession agreements signed without community consent by the government as illegal, and force them to be abandoned. “If you have lawyers who can challenge the legality of these concessions, it could be an entirely different thing, and the land rights could be very powerful,” said Francis Colee, who works for the environmental law firm Green Advocates, which compiles complaints for the RSPO on behalf of oil palm communities. He said he believed the era of 65-year concessions is over, thanks to the Land Rights Law, but those living on them are stuck. *Some names have been changed to protect the identities of those interviewed. Banner image: Jacksonville, Liberia. Photo by Jennifer O’Mahony for Mongabay.